We at SolarTown understand that there are many decisions that go into purchasing solar panels for your home. What brand of panels should I buy? How many should I buy? What type of solar inverter should I get? What solar racking do I need to mount my panels? The list can go on and on. 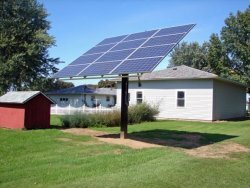 One question that is almost always asked is, "How can I improve the output of my solar system?" There are two ways of achieving this: either (1) increase your solar capacity by adding more panels to your array or (2) increase the efficiency of the panels you already have. Solar trackers offer the latter solution to the above question, and can improve total energy output of your system without breaking the bank on additional panels. Keep reading to learn more about the basics of solar trackers and if they are right for your home. One of the biggest issues with standard rooftop solar panels is reflection. When the sun hits the solar modules at a shallow angle, much of the light is diffused and reflected away and therefore cannot be harvested into energy. Since the position of the sun in the sky moves during the day (and during the year), there are often lengthy periods of time when regular static panels cannot optimally collect sunlight. Solar trackers can be added to any ground or pole mounted solar system in order to optimally track the movement of the sun in the sky throughout the day or year. Because solar panels are most efficient at making energy when positioned directly under the sun, solar trackers increase the amount of solar energy you can generate each day. Over 85 percent of post-2009 commercial installations greater than 1 MW are reported to use solar trackers. While they are typically used for large scale solar farms and desert solar projects, they are beginning to see use in residential markets. Solar trackers operate with the goal of minimizing the angle of incidence between the ray of incoming sunlight and the solar PV panel. Efficiency is optimal when the light hits the panel at a steep 90 degree angle, since the solar energy is more directly concentrated on a specific point on the panel. Related article: Solar Panel Efficiency: Have you checked your eta lately? Active Trackers: These use a motor and gear train system to direct the tracker based on either a manual controller or internal programming. Single-axis active trackers have one degree of freedom and rotate from North to South or East to West, depending on the latitude of where the panel is positioned. Dual-axis trackers have two degrees of freedom and therefore are able to harness more of the sun's light. Active trackers are guided by a sun-sensing device that rotates the tracker's axes based on the position of the sun in the sky. Once these photo-sensors pick up the optimal angle of light, the motor is switched off and the sunlight is collected. Often, active trackers produce more energy and efficiency than passive trackers (discussed below), though they do use more net energy since they have a running motor. They are used more frequently in larger-scale systems where users are trying to squeeze the most energy out of the available sunlight; however single-axis active trackers are also popular for residential users looking to elevate their solar energy output without spending a fortune. Passive Trackers: Another main tracker type is a passive tracking system. These smart trackers don't use motors, but instead rely on solar heat that tells the tracker how to move. Inside the trackers is a low boiling point compressed gas fluid that tilts the panel from side to side based on gas pressure imbalances created by the solar heat. Passive trackers use less operational energy than active trackers, but may encounter issues during start-up periods at the beginning of the day. Traditionally, a shader/reflector system that reflects early morning sunlight to "wake up" the panel can take nearly an hour. However, various self-releasing tiedown schemes have been recently used to position the tracker so the panel can operate as soon as the sun rises in the morning. Currently, passive trackers are the most popular type in home solar panel systems. They are often less expensive, require less maintenance, and provide strong conversion efficiency. Chronological Trackers: These unique trackers work by counteracting the Earth's rotation by turning in the opposite direction at an equal rate of movement. The tracker contains a timer and a motor similar to an active tracker that rotates based on pre-programming that takes into account date, time, latitude, year and various other factors. Chronological trackers are generally low-maintenance but may need their programming revisited and checked every few years. What are the benefits of trackers? Solar tracking is one of the most straightforward ways to improve the performance and economics of a solar installation. Compared to a fixed mount solar panel, a single-axis tracker increases annual output by about 30 percent and a dual-axis tracker an additional 6 percent. Other estimates say that solar panel trackers add between 25 and 45 percent to the efficiency of an average residential solar PV system. This can be very important in a residential setting if you are trying to get the most bang for your buck from your solar PV system. If you have a tracker, you will also need fewer panels to produce the same amount of energy. This is ideal for someone with space concerns or if roof availability or directional orientation is an issue. Trackers are easy to install, easy to operate, and inexpensive to maintain. Many trackers have control systems that allow the user to override the automatic controls and move the array up or down or east to west at will. This is particularly useful for removing snow or debris from the panels or tilting the array horizontally in extremely high winds. Solar trackers can support nearly all brands, sizes, and types of crystalline solar modules. They are also available in different sizes to hold any number of modules. A small auxiliary advantage of solar trackers, particularly those that are pole mounted, is the shade that is produced underneath them. The tall poles allow walk-under opportunities and use of ground space for plants that thrive on protection from sunlight. Ultimately, the flexibility of solar trackers translates to faster delivery, better quality, improved energy savings, and speedier investment returns on your entire solar PV system. What are the disadvantages of trackers? As with everything solar, solar trackers are an additional cost investment. It is up to you whether or not you view the added price as yet another expense or as a means to achieving greater energy efficiency. The price of solar trackers depends heavily on the size and type of tracker. However, it should be noted this cost is often offset by needing to purchase fewer panels for the overall system. The primary downside of solar trackers is their applicability. Installation of a tracker is not always feasible on a traditional slanted roof due to geometric constraints and heavy weights. Small single-axis trackers that only hold a few panels may be suitable for slanted rooftops but there is less of a risk when installing them on a flat roof or on a ground-mounted system. As a result, the majority of manufactured trackers are made for only ground or pole mounted solar arrays. A minor disadvantage is added maintenance. Solar panel tracking systems make a simple setup a little more complicated. With a traditional, static solar array, maintenance is simple. You set it up, make sure the panels stay clean, and reap the rewards. By adding a solar tracker to the mix, you are grouping all panels into a single array with only one point of failure. This means that the array will be locked into place if the photo-sensors, motors, or compressed gas fluids stop working. Therefore, your tracker must be monitored more than usual to make sure all parts are working. One word of caution: if one of the major financial considerations is the economic incentives that you may be eligible for. Some economic incentives for solar energy systems are based on system size, not output. If you have solar trackers, this may actually decrease the solar rebate you receive, since trackers require fewer panels but provide more efficiency. Please check the schedule of economic incentives if you have any concerns about this. Will solar trackers work for my home? If you decide that a solar tracker is the way you want to go for your home, then you should review the solar trackers that we have available at SolarTown and then contact us if you have any further comments or questions.